Wendy Osher/ Maui Now graphic. Maui gas prices have fallen further this week and gas price declines around the islands picked up speed over the past week, according to the AAA Hawai‘i Weekend Gas Watch. In Kahului, the average price is $4.06, which is six cents lower than last Thursday, 11 cents lower than on this date last month and 40 cents higher than on this date a year ago. Wailuku’s average is $4.06, which is six cents lower than last Thursday, 11 cents lower than on this date a month ago and 40 cents higher than on this date a year ago. 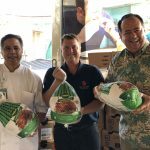 The Hilo average price is $3.76, which is down six cents from last Thursday, 21 cents less than on this date last month and 53 cents higher than on this date a year ago. 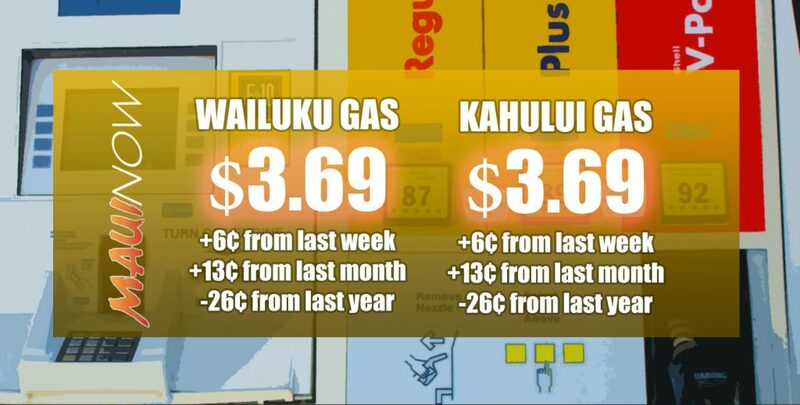 Līhue’s average price for regular is $3.91, which is eight cents lower than last Thursday, 15 cents lower than on this date last month and 58 cents more than a year ago. In Honolulu, today’s average price for regular is $3.57, which is eight cents lower than last Thursday, 22 cents lower than on this date a month ago and 48 cents higher than on this date last year. Today’s statewide average price is $3.72 a gallon, which is seven cents lower than last Thursday, 18 cents lower than a month ago and 48 cents more than a year ago, according to GasPrices.AAA.com.